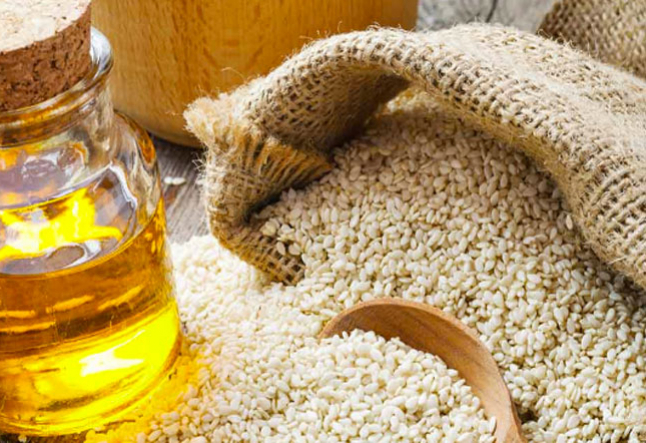 The medicinal properties of sesame seeds have been widely recognized in India since ancient times. They protect the body and mind from a wide array of ailments and are associated with rejuvenation and longevity. Sesame seeds are warming and nourishing. They are rich in essential fats, vitamins, and minerals with anti-bacterial and anti-inflammatory properties to alleviate numerous conditions. The warm sesame seed face mask is great for all skin types. It cleanses, nourishes and hydrates the skin, leaving it smooth, toned and moisturized. • To prepare, grind 2-3 tablespoons of white sesame seeds to a fine powder. • Add the sesame seed powder to half a mashed, ripe banana (which contains anti-aging properties) and mix well. • Warm the mixture gently over a bowl of hot water, to release the natural oils from the ground seeds. • Apply to the face and neck, including the eye area and lips. • Leave for up to 20 minutes. The warm sesame seed oil hair treatment for all hair types strengthens the hair shaft and nourishes the hair, leaving it soft, shiny and dandruff-free. • Place two to three tablespoons of cold-pressed sesame seed oil in a small bowl. • Add one tablespoon of freshly squeezed lime juice, which removes the accumulation of synthetic substances from the hair, and mix thoroughly. • Warm the mixture gently over a bowl of hot water until lukewarm. • Apply to the scalp and gently massage, using small circular motions, for ten minutes. • Work the oil through to the ends of the hair. • Cover with a shower cap and a warm towel to retain the heat. • Leave for an hour or overnight to repair damaged hair, and wash with a natural shampoo. The sesame seed oil nail and cuticle treatment nourishes and strengthens nails, and helps to alleviate weak, brittle nails and rough, dry cuticles. • Place 2-3 tablespoons of cold-pressed sesame seed oil in a small bowl. • Add 5 drops of lime essential oil, which encourages nail growth. • Gently warm the mixture over a bowl of hot water until lukewarm. • Place your fingertips in the warm oil for up to 20 minutes. • Allow the oil to remain on your fingertips, and firmly rub the fingernails and cuticles of the left hand with the fingernails and cuticles of the right hand, for 5 minutes. • Wipe any excess oil and allow a thin layer to remain on the nails overnight. • Apply 2 or 3 times a week. • Massage the remaining oil into your ankles, feet, and toenails before bedtime to promote relaxation and deep sleep. The acupressure points on the surface of the nails correspond to the scalp and the hair. Stimulating these points by the above technique increases blood flow to the nails and regulates the energy in the scalp, to strengthen the hair, prevent hair loss and promote hair growth. Sesame seeds, dates, and carob each contain healing properties to nourish the tissues and promote radiant skin, lustrous hair and strong nails from within. Leave the ingredients to infuse overnight and blend in the morning which activates the enzymes to assist with digestion. Including sesame seeds in the diet, especially during the cooler months, warms, nourishes and rejuvenates the tissues, boosts the immune system, lowers stress and anxiety, cleanses the liver and regulates the hormones.